Does the sound of a mini break without children have you wide-eyed, excited and raring to go? “I feel normal again” Mrs S said having spent 3 idyllic nights in the penthouse. “No rushing around or animals in the bed, it’s been amazing!” She woke to champagne and handmade cards addressed to ‘mummy’ – we wonder who put those there? Mr S was very happy with his choice, and could give himself a big pat on the back for making this weekend one she’ll remember for a long time. Birthdays and anniversaries are the perfect excuse to indulge in romantic weekend breaks. A holiday in Cornwall is just the ticket to recharge the batteries and de-stress. But why wait till then? Picturesque Fowey on Cornwall’s south coast is a fabulous destination. 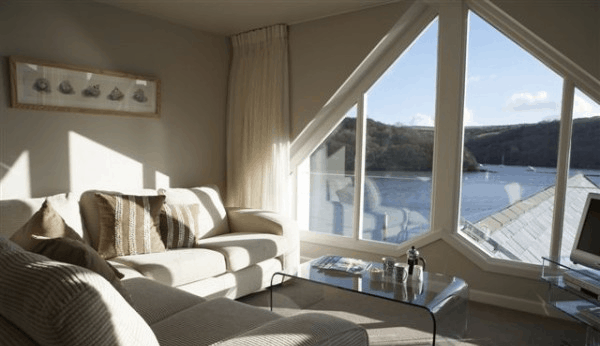 It’s perfect for exploring, relaxing, and soaking up the stunning estuary views. Couples weekend breaks give you the time to spend together and re-connect without needing to worry about keeping the children entertained. The Old Quay House boutique hotel on Fowey’s waterfront is a luxury hideaway where couples can put their feet up and enjoy the finer things in life. Our guests say it’s the little touches that really set us apart from other hotels. We’ve got all you need to enjoy a perfect weekend break by the sea. Wake up slowly in a big comfortable bed then linger over a delicious breakfast cooked to order, perhaps French toast or Eggs Benedict? Have a nosy at the morning’s paper and take a leisurely stroll to Readymoney Beach. In the afternoon explore the town’s boutiques and galleries before relaxing on the terrace with a chilled bottle of wine. The stylishly appointed lounge has big comfy sofas perfect for snuggling up in the evening. We all need a break from busy work schedules and screaming children now and then. So come and indulge in some ‘us’ time in our luxury hotel in Cornwall. We feel we ought to add that a stay at The Old Quay House comes with a warning….you you may find it hard to leave!